Get the scoop on how to pack a better lunch from Women’s Weight Loss Coach and Fitness Expert Stephanie Mansour. 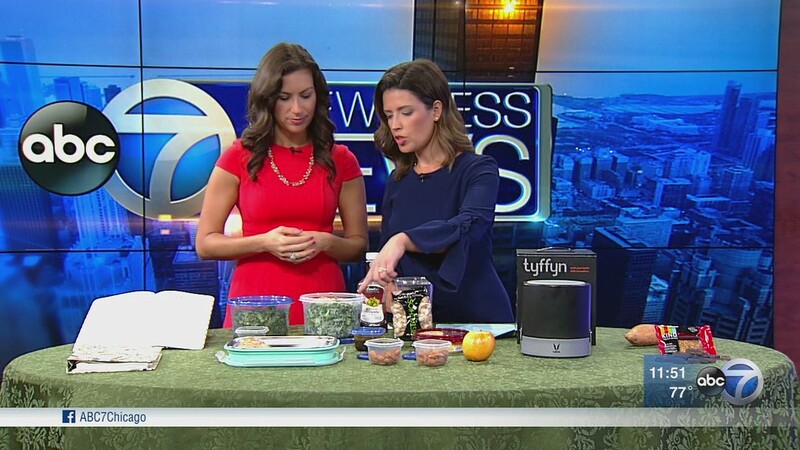 Check out her recent interview on ABC 7 Chicago in which she goes over five simple ways to pack fast, healthy lunches that are good for you and the kids! The morning is busy enough, so you definitely don’t want to put off packing the day’s lunches to right before rushing out the door. As I like to remind my private weight loss clients one of the keys to success is careful planning. Take a look at your upcoming schedule, utilize a planner or a calendar, and write down how many lunches you need to prepare for yourself and your kid(s) vs. how many meals might be eaten outside of the home. Take the number of meals you need and base your shopping list off of it. Now that you have your number of lunches needed and your grocery list you can get to the store and grab everything you need in one full swoop! For example if you decided you need four lunches for yourself for the week, that means you need to be shopping for four proteins, four greens, four snacks, etc. Nobody wants to eat a soggy salad. Make it easy on yourself by investing in plenty of different-sized ziploc containers. Pack your proteins separately from your greens, and your dressing measured out in its own container. Keep yourself from going overboard on your daily amount of healthy fats by pre-packaging out your almonds, pistachios, and nut butters. Portioning out serving sizes of hummus is a good idea as well! And bonus, buying nuts in bulk and packing them into smaller containers yourself is easier on your wallet than buying those individual packages. Do all your food packing the night before so they’re ready to grab ‘n go in the morning! An important part of any sustainable weight loss program is to have enough healthy options available that when hunger pangs strike you won’t derail. For this reason I recommend adding an extra piece of fruit into your lunch bag. Something delicious and fiber filled like an apple is wonderful. Yes, best news ever, desserts can be healthy! Pack yourself a healthy dessert to enjoy post-lunch and curb any sugar cravings that might creep up on you in the afternoons. My favorites are a sweet potato warmed up in the microwave, a granola bar, or even a little bit of dark chocolate. Aim for one that’s over 70% cocoa for the best benefits. Fourth of July can be fun but filling! There will be plenty of good foods and tasty temptations this week, but, luckily, it can be simple to gain freedom from obligations and the pressure to fill and finish your plate. I stopped by Fox to talk about setting boundaries and taking our diets into our own hands. The Fourth of July is a day where you are surrounded by your friends, family, and loved ones. Tell them you are on a healthy eating program and do what feels best for you and your body. Ask them to respect your decision. They care about your health and will support you. Just because you are eating healthier doesn’t mean you are missing out on the party! In fact, you will feel more energized by the nutritious food and your own willpower! As a private weight loss coach, part of my commitment to my clients is to give them the confidence to make responsible and healthy decisions. One of my clients recently brought a head of lettuce to a party as a substitute for a burger bun. Her friends didn’t even question it because she communicated her goals to them. She took control of her diet and thanked herself for it! You can also choose to have your diet be a private mission. If you are reluctant to share your eating habits and diet with others, another solution is to create a story for yourself. This is going to be a story that you can follow and one that will support your eating if people begin to pester you. You can tell people that your stomach is feeling a little off or, if you’re at a bar, you can say that you’re going to ease into your drinks. Just be honest with yourself so that other people understand your decisions and don’t question your decisions. Think ahead so that you can set yourself up for success! Don’t show up to an event starving because the food and drinks will be very tempting! Have a bite to eat before you arrive so that you are in full control. This way you can enjoy the food and engage socially without overindulging. Eating beforehand can also be a great opportunity to get the nutrition that may not be provided at the event. I had another client that was eating junk food in the late afternoon. She prepared herself for the day and started eating proteins in the morning and midday. Very soon, she was able to abandon those cravings for junk food that she had just one week ago! Planning ahead can make all the difference. Further, even if you are on a strict eating plan, something looks good, and you want to taste it, taste it! Just don’t overdo it. During my time spent bettering weight loss programs for women, I’ve learned that judgment can quickly and unfortunately come into play. As you can imagine and have probably experienced, it can be difficult to hold ourselves accountable with so many temptations. Be easy on yourself while being thoughtful. Understand that having a bite of an unhealthy food does not depreciate the value of all your hard work thus far, but monitor how often you are having these unhealthy bites. You want to remain healthy while still enjoying yourself. And you can! Finally, have fun! The Fourth of July is a great holiday that is meant to be enjoyed! You will be surrounded by so many good foods so eat them! Don’t punish yourself later for your mistakes. Just be ready to hop back on the next day. Any eating plan you have does not follow an all-or-nothing mentality. Don’t be hard on yourself. The negative emotions you feel after eating unhealthy foods can be even worse for you than the food you ate. Try to take control of your eating so that you can enjoy the holiday even more! Weight loss coach, Stephanie Mansour, stopped by the Sirius XM Radio studio to chat with Today Show host, Hoda Kotb, live on The Hoda Show . As a weight loss coach for women, one of the most important messages I’m passionate about spreading is that weight loss is not just about fitness and it’s not just about watching what you eat. While it is important to step it up with your nutrition and workouts, it’s equally, if not more, important to step it up mentally. If you want to reach your fitness and weight loss goals, first you have to believe that you deserve to hit those goals. If you don’t feel like dragging yourself off the couch, you have to change your thinking first. If you’re too embarrassed to walk into the gym because you haven’t worked out in over a year, you have to build your confidence first. If you want to stop binging on a whole row of Oreos every night, you have to believe you deserve to treat yourself better first. There’s a mental shift that has to happen in order for you to value yourself so much that you want to do healthy things for yourself. I know this because I experienced this mental shift myself over a decade ago and it made all the difference — I finally lost the weight and kept it off for good! Plus, I’ve helped my private weight loss coaching clients and the women in my community do the same. Once you shift your thinking, you’ll skip the emotional eating, pass over junk food, and enjoy moving your body. Instead of rewarding yourself with a milkshake or zoning out on the couch at the end of a long day, you’ll begin to reward yourself with a healthy salad or a fun walk around your neighborhood. Then, after you’ve made this powerful mental shift and you’ve created healthy new habits, there’s absolutely nothing wrong with eating a few Oreos occasionally if you want — everything in moderation! Recently, I stopped by the Sirius XM Radio studio to chat with Today Show host, Hoda Kotb, live on The Hoda Show. Listen to the interview HERE to hear my story about how I struggled to lose weight, the mental shift that turned it all around, and the strategies you can use to shift your thinking too. Want to start shifting your thinking so you can finally reach your weight loss goals? Join us for FREE guidance and support! Sign up for the FREE 21-Day Challenge for a simple but powerful workout plan, an easy-to-follow eating guide, and fun confidence-boosting exercises. 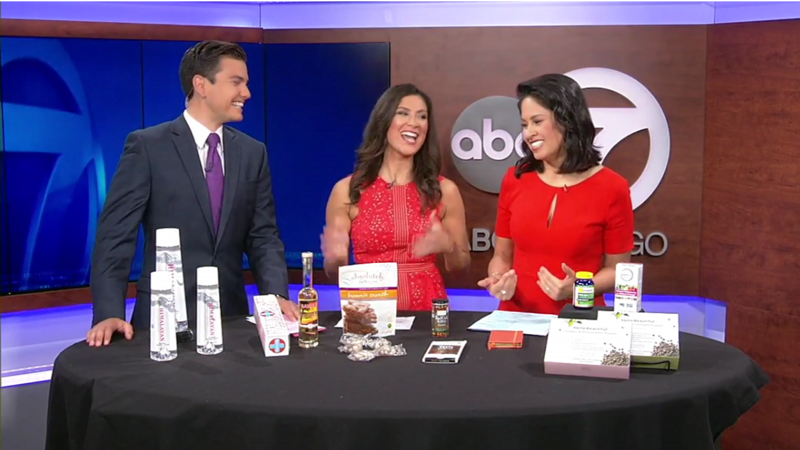 Chicago weight loss coach for women, Stephanie Mansour, stopped by ABC 7 Chicago to dish out some healthy eating tips and give the scoop on healthier ice cream options that you’re sure to love. What kind of weight loss coach tells you to eat ice cream? I do! What I’ve learned over the years is that nobody wants to go on a diet that requires cutting out all of your favorite foods. It’s a sure way to set yourself up for failure and disappointment. That’s why I don’t believe in diets or deprivation. Instead, I want to set you up for success; so I encourage my clients to make the healthiest choices possible as often as possible. And you know what? It works! (Check out some of my client success stories here). My private weight loss coaching clients are often shocked to find out that they don’t have to give up the things they love to eat. And my advice to you, too, is that you don’t have to give up what you enjoy eating if you want to reach your weight loss and wellness goals. In some cases, you may choose to indulge in moderation. But in most cases, you can find healthier options that are equally delicious and satisfying that you can substitute for your go-to treat. And here’s a secret–there’s a good chance that you’ll end up liking the healthier option even better! Once you cut the junk and start focusing on getting more nutrient-rich foods in your diet, you’ll be able to taste the difference and feel the difference in how your body responds to low-quality foods. I recently stopped by ABC 7 Chicago to dish out some healthy eating tips and give the scoop on healthier ice cream options that I think you’ll love. Want more guidance and support in making healthier choices when you eat, so you can finally lose the excess pounds that are holding you down? Join the FREE 21-Day Challenge with weight loss coach Stephanie Mansour for a simple but powerful workout plan, an easy-to-follow eating guide, and fun confidence-boosting exercises. Discover the science behind emotional eating and learn how to avoid emotional eating with weight loss coach and health and fitness expert, Stephanie Mansour. Have you ever wondered how to avoid emotional eating? If you sometimes find yourself scarfing down a bag of chips at your desk while you’re trying to meet a deadline or mindlessly eating a pint of ice cream at the end of a long stressful day to numb out, you’re falling victim to emotional eating. In my experience as a women’s weight loss coach, I’ve found that emotional eating is one of the most common problems that my private weight loss coaching clients struggle with daily. I also find that as soon as I mention to someone during a conversation that I’m a weight loss coach, the conversation about emotional eating comes up immediately. Everyone wants to know how to stop reaching for a candy bar when the going gets tough or turning to cookies when they’re feeling sad. Emotional eating is nothing to be ashamed of, but it is important to learn how to avoid emotional eating. Unfortunately, emotional eating is not harmless and it doesn’t help you feel better or improve the problem that caused you to want to eat in the first place. When you let emotional eating get the best of you, you’ll tend to choose poor-quality foods that are low in nutritional value and high in salt, sugar, fat, and calories. It can lead to binge eating disorders, food addiction, health problems, obesity, low self-esteem, and difficulty losing weight. Recently, I visited Fox 32 Chicago and sat down with Sylvia Perez to discuss the science behind emotional eating, the physiological triggers that cause emotional eating, and what you can do to avoid emotional eating. Tips I cover include rewarding yourself with healthy choices and indulgences that feel good — anything from a kale salad at your favorite restaurant instead of eating at home to scheduling a wellness-centered vacation or staycation. I recently had an amazing trip to Miraval Resorts in Arizona and I’m looking forward to an upcoming Katanga Fitness Retreat getaway. Treating yourself, changing your scenery and pace, and staying active will help you focus on your well-being and shift your thinking away from turning to food for comfort. I often suggest that women visit a local spa or manicurist, or even paint your own nails, take a bubble bath, and do some self-care at home. Go to the park, visit a museum, call a friend — anything you enjoy to change your frame of mind away from food as a default. Want more guidance on how to avoid emotional eating and get on track to finally lose the weight for good and step it up for life? Join the FREE 21-Day Challenge with weight loss coach Stephanie Mansour for a simple but powerful workout plan, an easy-to-follow eating guide, and fun confidence-boosting exercises. 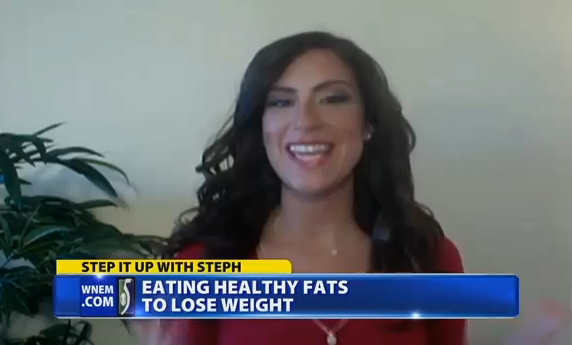 Up next, our Weight Loss Coach Stephanie Mansour from Step It Up with Steph is here to share with us why we need to eat more fat…to lose weight! That’s right, as Chicago’s top weight loss coach for women, I’m telling you to eat more fat to get skinny. And I’m using the term “skinny” very loosely here. It’s just a little catchier to say “eat fat to get skinny” but really I mean we need to eat fat in order to get stronger, healthier, and lose weight. Add these foods into your daily diet (except aim for at least 2 times per week of fish), and you’ll be fending off cravings and on the road to weight loss in no time! Stephanie Mansour is Chicago’s best life coach and Chicago’s best weight loss coach for women. Steph is a corporate wellness speaker and a health and fitness expert in Chicago. Steph is a health and fitness on-air correspondent and coaches women in Chicago on how to lose weight fast and maintain weight loss.